Pot measures approximately 6" tall, 1-3/4" wide, and is 9-1/2" long (front to back). This beautiful style of Navajo art is called horse hair pottery because actual horse hair is added to the pottery at just the right moment in the firing process to melt the hairs into the pottery, creating unique and incredible designs. This Buffalo pottery was Navajo hand etched, with stunning traditional patterns and exquisite Water Wave designs, by artist Vail. 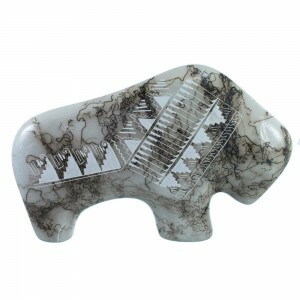 The Buffalo is one of the most important animals to the people of the Plains and it is a great symbol to most Native Americans. The Plains Indians had developed life around the buffalo using it in many different ways. It was used for food, tools, shelter, warmth, and weaponry. 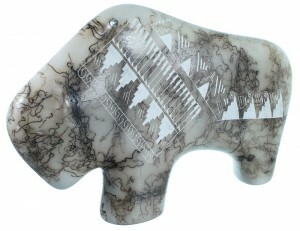 To some, the Buffalo represents strength, stability, and prosperity. In Native American beliefs, the water waves design represents continuous life.